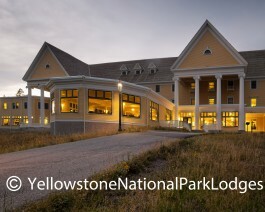 Lake Yellowstone Hotel was completed in 1891 and restored to its 1920s grandeur in 1990. The majestic hotel sits on the shore of Yellowstone Lake and is listed on the Register of Historic Places. The serenity of Yellowstone Lake illuminates through the “Sun Room” windows, as guests daydream to the delicate sounds of a string quartet in the lobby. A casually elegant restaurant features a delightfully extravagant menu. Hotel guestrooms capture the historic 1920’s ambiance, while an adjacent annex and nearby cabins provide more basic and economical options. Please note that all park accommodations are non-smoking and reflect the natural surroundings of Yellowstone; televisions, radios, air conditioning, and Internet service is not available. Dining, Lounge, Gift Shop, Gas, Fishing, Tours, Wheelchair Access.